You visit a world whwere Robots strain to remember the existence of the Men who created them; hear the tantalizingly brief report of a man who returns from a trip to the future; see the snake-armed Thing who emerges from the mind of the people who conjure it.You meet a souvenir hunter in the Thirtieth Century and a schoolgirl who tries to cope with the teaching methods of the Twenty-second Century. You share the terror of an astronaut in a “haunted” space suit and the dilemma of a wife whose husband knows a common chemical formula for destroying the earth. In short, you feel the impact, the originality, and the uncanny atmosphere created by these science fiction expcerts not once—but fifty times. Fifty Short Science Fiction Tales have been selected for their concise writing, and for punch lines that leave the reader “surprised, shocked, and delighted at the final sentence.” According to the editors, another important aspect of this literary form is “evocation of a background different from our own.” Consequently, though some of the stories are just a page long, the reading experience is always excitingly unique. This is a pleasant anthology, a collaboration by Asimov and one of science fiction’s several indefatigable anthologizers, Groff Conklin. 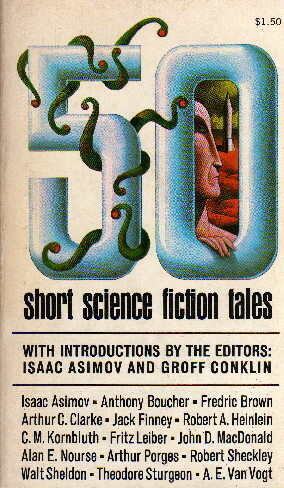 It represents an anticipation of Asimov’s work with Martin H. Greenberg and, in particular, some of the anthologies of short-shorts they did together. This book consists of fifty stories, none very long, many very good and a few not-so-good. As I say, it’s pleasant, and worth having of one can manage to find a copy.